Nomination Deadline: February 19, 2019, for books published in 2018. Titles for the year 2019 can be nominated by publishers or the reading public. In addition to being published in 2018, the nominated book should have any aspect of the nineteenth-century periodical press as either its central focus or as a substantial element in its scholarly discussion. Monographs, edited volumes of essays, reference books, bibliographies, and scholarly editions are eligible for consideration, as well as biographies or critical studies of people who edited, financed, contributed to, or illustrated periodicals. The Colby Book Prize was endowed in 2006 in memory of Robert Colby by his wife, Vineta Colby, distinguished scholars and long-time members of RSVP. In 2011, following Vineta’s death, the Board of Directors of RSVP unanimously voted to re-name the prize to honor both Robert and Vineta Colby for their many fine contributions to the study of Victorian periodicals and their long commitment to RSVP. The Colby Prize is intended to honor original book-length scholarship about Victorian periodicals and newspapers, of the kind that Robert and Vineta Colby themselves produced during their careers. 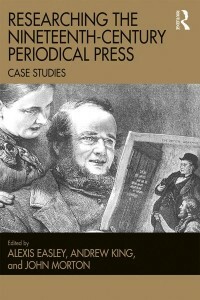 The annual prize is awarded to a book published during the preceding year that most advances our understanding of the nineteenth-century British press. The winner receives a monetary award of up to $2,000 and is invited to speak at the following year’s RSVP conference. The 2018 winner of the Robert and Vineta Colby Scholarly Book Prize is Researching the Nineteenth-Century Periodical Press: Case Studies, co-edited by Alexis Easley, Andrew King, and John Morton. It was a great pleasure to see over all the submissions how the study of nineteenth-century periodicals and newspapers continues to inform thinking about areas that go well beyond its boundaries. Andrew King, as both chair of the committee and as as one of the editors of the winning volume, abstained from the decision making process. 2017: The Routledge Handbook to Nineteenth-Century British Periodicals and Newspapers co-edited by Andrew King, Alexis Easley and John Morton (Abingdon: Routledge, 2016). 2016: Mary Shannon for Dickens, Reynolds, and Mayhew on Wellington Street: The Print Culture of a Victorian Street, (Abingdon: Routledge, 2015). 2015: Caroline Bressey, Empire, Race and the Politics of Anti-Caste (Bloomsbury, 2014), Honorable mention: Martin Hewitt, The Dawn of the Cheap Press in Victorian Britain: The End of the ‘Taxes on Knowledge,’ 1849-1869 (Bloomsbury, 2014). 2013: Aileen Fyfe, Steam-Powered Knowledge: William Chambers and the Business of Publishing, 1820-1860 (Chicago, IL: Chicago University Press, 2012) and Robert Patten, Charles Dickens and “Boz”: The Birth of the Industrial Age Author (Cambridge: Cambridge University Press, 2012). 2012: Joel Wiener, The Americanization of the British Press, 1830s-1914 (Basingstoke: Palgrave, 2011). 2011: Patrick Leary, The Punch Brotherhood: Table Talk and Print Culture in Mid-Victorian London (London: British Library, 2010). 2010: Mark Schoenfield, British Periodicals and Romantic Identity (Basingstoke: Macmillan, 2008) and Laurel Brake and Marysa Demoor (eds) The Dictionary of Nineteenth-Century Journalism (Gent and London: Academia and the British Library, 2009). 2009: Catherine Waters, Commodity Culture in Dickens’s Household Words: The Social Life of Goods (Aldershot: Ashgate, 2008). 2008: Kathryn Ledbetter, Tennyson and Victorian Periodicals: Commodities in Context (Aldershot: Ashgate, 2007). 2007: David Finkelstein, Print Culture and the Blackwood Tradition, 1805-1930 (Toronto: University of Toronto Press, 2005). 2006: Linda Hughes, Graham R.: Rosamund Mariott Watson, Woman of Letters (Athens: Ohio University Press, 2005). 2006: Peter Morton, The Busiest Man in London: Grant Allen and the Writing Trade, 1875-1900 (0New York and Basingstoke: Palgrave Macmillan, 2005).